Researchers at the University of Dundee have found that a combination of pesticides commonly used by farmers can interfere with bees' brains. The team discovered links between the use of neonicotinoid pesticides, and another type of pesticide - coumaphos - harmed the insects' ability to learn. A previous study by Newcastle University suggested the same chemicals affect bees' memories. 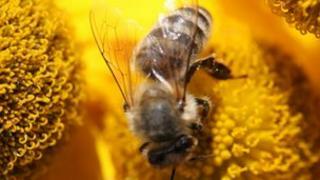 The scientists said it raised questions about the use of the pesticides. The study, which is published in the journal Nature Communications, looked at what impact the two chemicals had on bees' brains. Neonicotinoids are the most widely used insecticide in the world, while coumaphos is used in honeybee hives to kill the Varroa mite, a parasite that attacks the honey bee. The researchers, led by the university's Dr Christopher Connolly, found that the pesticides could interfere with the learning circuits in the bee's brain. They also found that bees exposed to combined pesticides were slower to learn or completely forgot important associations between floral scent and food rewards. The intact bees' brains were exposed to pesticides in the lab at levels predicted to occur following exposure in the wild, and brain activity was recorded. It was found that both types of pesticide target the area of brain involved in learning, causing a loss of function. If both pesticides were used in combination, the effect was greater. The study is the first to show that these pesticides have a direct impact on pollinator brain physiology. It was prompted by the work of collaborators Dr Geraldine Wright and Dr Sally Williamson at Newcastle University, who found that combinations of these same pesticides affected learning and memory in bees. Their studies established that when bees had been exposed to combinations of these pesticides for four days, as many as 30% of honeybees failed to learn or performed poorly in memory tests. Dr Wright said: "Pollinators perform sophisticated behaviours while foraging that require them to learn and remember floral traits associated with food. "Disruption in this important function has profound implications for honeybee colony survival, because bees that cannot learn will not be able to find food." The researchers have expressed concerns about the use of pesticides that target the same area of the brain of insects and the potential risk of toxicity to non-target insects. Dr Connolly said: "Much discussion of the risks posed by the neonicotinoid insecticides has raised important questions of their suitability for use in our environment. "However, little consideration has been given to the miticidal pesticides introduced directly into honeybee hives to protect the bees from the Varroa mite. "We find that both have negative impact on honeybee brain function." He added: "Together, these studies highlight potential dangers to pollinators of continued exposure to pesticides that target the insect nervous system and the importance of identifying combinations of pesticides that could profoundly impact pollinator survival." Are pesticides harming UK bees?